The Stewart Collective Fete is a one-day celebration of nature and neighbourhood, and is proud to host a series of creative workshops, craft markets, food stalls, live music and entertainment for all members of the community to enjoy. The Rhythm Tree uses the medium of music and movement to create a joyful, family music-making experience, in a nurturing, playful and non-performance orientated environment. Adults and children participate at their own level. The classes are suited to baby, toddler and preschool children. Free, sign up to avoid disappointment. One ticket permits one family. Come learn how to make your very own eco-inspired nature mobiles with crafter Beci Orpin. Suitable for children and adults. One ticket per person. Find your own creativity and style through the medium of weaving and come join Maryanne for a fibre sculpture class at The Stewart Collective Fete. Take part in a fun native flora painting class, painting with inks and watercolours. It's the perfect opportunity to get creative with your little one. Suitable for children and parents. One ticket per person. Throughout the day, guests will be able to get their caffeine hit from Royal Road Coffee and enjoy nostalgic eating experiences with all-day tacos from the Taco Truck, and more. The fete is suitable for all ages and four-legged friends will also be welcome, with a designated ‘barking lot’ to keep your pooch safe and hydrated throughout the day. Kids will also be able to enjoy a free colouring in station, with artwork designed especially by Dawn Tan! Entry into the fete is free with costs varying per workshop. Bookings are essential for the workshops. 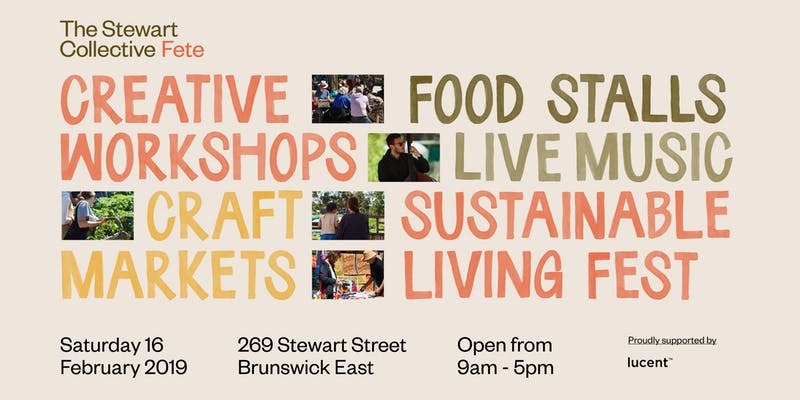 The Stewart Collective Fete is proudly supported by Lucent and the Sustainable Living Festival 2019.